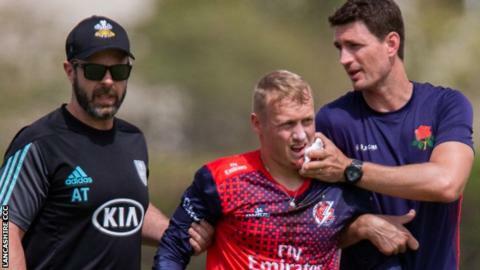 Lancashire spin bowler Matt Parkinson has had an operation on his jaw in Dubai after being injured in a pre-season game against Surrey. The 22-year-old was hit in the face by a shot from Surrey and England batsman Mark Stoneman during a 10-over match. Scans did not reveal any fractures, but a plastic surgeon was needed to repair a deep laceration. Lancashire start their first Championship game of the new county season against Middlesex on 11 April. The club have not revealed how long Parkinson is expected to be out of action.